Free Trident Singles Gum (14-18 pieces, any variety) in Kroger stores, with coupon. This Kroger Free Friday Coupon is available for download on Friday, September 29, 2017 but you have until October 15, 2017 to redeem it. What is Trident Singles Gum? Cleans and protects teeth. Chewing this gum may help reduce the risk of cavities. Ingredients: Sorbitol, Gum Base, Xylitol, Glycerin, Natural and Artificial Flavoring; Less Than 2% of Acesulfame Potassium, Aspartame, BHT (to Maintain Freshness), Mannitol, Soy Lecithin, Sucralose. Contains Soy. Phenylketonurics: Contains Phenylalanine. 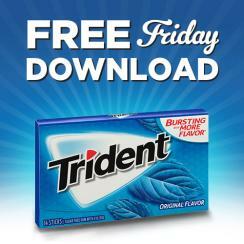 Redeem your coupon in-store within 2 weeks for One Free Trident Singles Gum (14-18 pieces, any variety). Your coupon will automatically be applied at checkout when you use your Shopper’s Card. Available in most stores.